Australia is one of the most popular tourist destinations in the world. The country boasts a perfect amalgam of natural beauty and man-made wonders. Lying between the Indian and the Pacific Ocean, Australia is the world’s 6th largest country by total area. The country is geographically so diverse that it can almost take a month to visit all the wonderful places here. If you are planning to visit Australia with family or friends, you can refer to the Australia Travel Guide we have prepared for you. There is a lot to see and do in Australia and hence an itinerary of 10-14 days will be ideal. Australia has predominantly 4 main seasons-Summer, Autumn, Winter, and Spring. You can visit Australia during any of these seasons, but, if you really want a comfortable trip, you can plan your journey anytime between September to November and March to May. 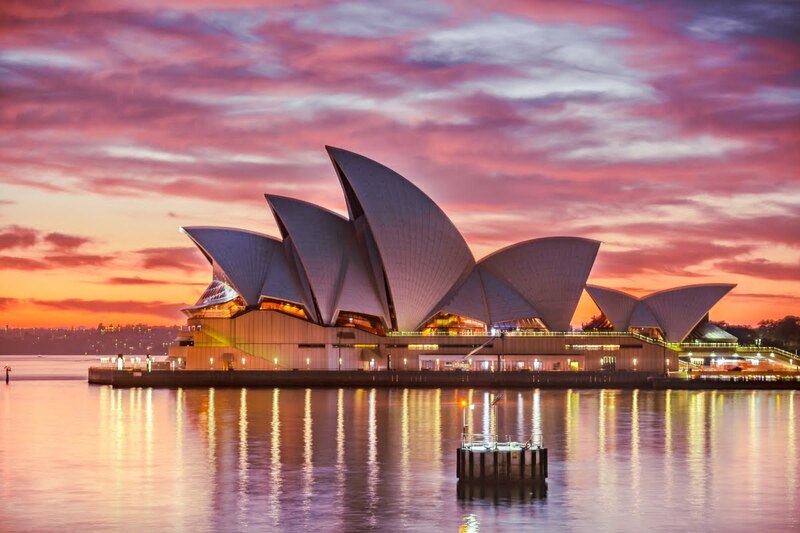 Sydney is the largest city in Australia offering beautiful beaches and is the home to some of the best tourist attractions in Australia like the Sydney Harbour Bridge and the Opera House. You can soak under the sun at the beautiful Bondi Beach and Coogee beach or visit the Royal Botanical garden or shop around Sydney and explore plenty of museums like the Art Gallery of New South Wales or the Australian National Maritime Museum. It is the world’s largest Barrier Reef and a must visit place to enjoy underwater fun activities like scuba diving and snorkelling. The whole stretch of the Great Barrier Reef is a home to exotic species of marine life and different corals. Standing more than 1000 feet above sea level, Uluru, also known as Ayer’s Rock, is a huge sandstone monolith which is declared as a UNESCO world heritage site. Uluru is known to change its colour during different times of the day, especially at dusk and dawn, when it turns red. Melbourne is popularly known as the “Australian Food Capital”. The urban setting and dainty lifestyle in Melbourne offers the best-in-class experience to its tourists through its top class restaurants, shopping centres, sport venues, pubs and much more. Kakadu is Australia’s largest terrestrial national park. The tropical environment of the park along with flora and fauna living there is a treat to the eyes. You should also visit the park to witness the rock art on the aboriginal rocks located there. Gold Coast is a beach lover’s paradise with stretch of golden sands merging into the enormous blue sea. The place is popular for activities like surfing and has many themed water parks like Dreamworld and Wet’n’Wild. Gold Coast is also famous for its extravagant nightlife. This coastal town in South Wales is a perfect place for the honeymooners who want to spend their time amidst the serenity and peace of this place. The place is known for its beautiful beaches and has chic resorts located around. A walk through the Cape Byron track is a must do activity here. The Blue Mountain National Park is a home to exotic species of animals and birds. The park offers unparalleled views of the wonders of nature. The “three sisters”, a towering sandstone formation is a prominent visiting spot in the park. The Australian cuisine is famous for its barbecue which is mainly made from Kangaroo meat, chicken and beef here. You can also try “Damper”, which is traditional Australian bread. Australia is also known for its “Anzac biscuits” and “Melba Peach”, a dessert made with peach, vanilla syrup and raspberry coulis. You can also try the Australian meat pies for breakfast. A trip to Australia is incomplete without tasting its wine. You can find wines at any restaurant in Australia or you can buy it from the local wine shops. You can also check out special “Wine Tours” conducted by local guides in Australia and take part in it. Australia is a popular tourist destination and hence has ample of hotels and resorts available at the different price range. You can also try for Homestays if you want to save on some bucks without compromising on the quality. You can also try camping by staying in tents, however, you’ll need to take permission to camp from the concerned authorities in the area. Australia has a good connectivity throughout the country through its public buses, rails, metros and trams (in a few areas). Although you can book a private car anytime, the real essence of the country can be enjoyed by availing any one of the local transport available in order to commute to different places. For all your travel planning, reach out to Pickyourtrail. A travel-tech company based in India, Pickyourtrail specializes in customized international travel vacations. So what are you waiting for? Pack your bags mate and get ready for an exciting trip to Australia!